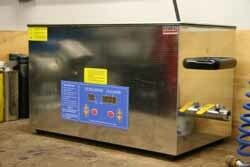 Bob’s BMW is NOW offering commercial grade Ultrasonic cleaning for your motorcycle parts. The BEST part is that the equipment does not need to be disassembled. Ultrasonic cleaning is powerful enough to remove tough contaminants, yet gentle enough not to damage the substrate. It provides excellent penetration and cleaning in the smallest crevices and between tightly spaced parts in a cleaning tank. It is a excellent way to clean little parts without touching them with a brush and harsh chemicals.